This function allows you to program the vehicle to maintain relative distance to the vehicle ahead without depressing the accelerator pedal or brake pedal. 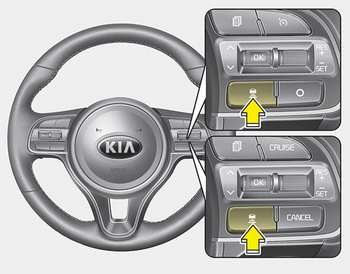 The vehicle to vehicle distance will automatically activate when the smart cruise control system is on. Select the appropriate distance according to road conditions and vehicle speed. 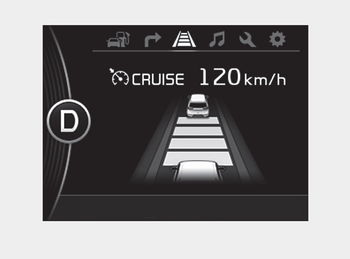 The 'Distance 4' is always set when the system is used for the first time after starting the engine. The smart cruise control system remember the last vehicle to vehicle distance which the driver used in the vehicle with AEB. 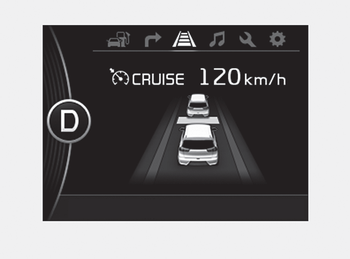 The vehicle will maintain the set speed, when the lane ahead is clear. If the vehicle ahead speeds up, your vehicle will travel at a steady cruising speed after accelerating to the selected speed. The warning chime sounds and LCD display blinks if it is hard to maintain the selected distance to the vehicle ahead. If the warning chime sounds, actively adjust the vehicle speed by depressing the brake pedal according to the road condition ahead and driving condition. Even if the warning chime is not activated, always pay attention to the driving conditions to prevent dangerous situations from occurring. 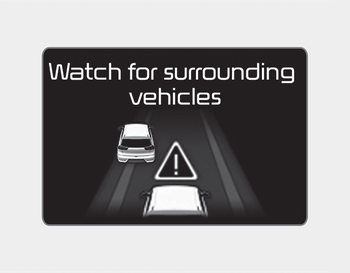 If the vehicle ahead (vehicle speed: less than 30km/h) disappears to the next lane, the warning chime will sound and a message will appear. Adjust your vehicle speed for vehicles or objects that can suddenly appear in front of you by depressing the brake pedal according to the road condition ahead and driving condition.